I just said goodbye to my friend Katie, who’s moving from Boston to California this week. I’m so sad. Not just because it feels like I’m losing a dear friend, but also because I just can’t handle the idea of having a third baby without one of my best “mom friends” around. Katie and I met when our daughters started preschool together. She was the one who tipped me off to the “spying spot” on the very first day of school. In fact, she crouched in the corner by the chain link fence with me, and got all teary eyed right along with me. While our girls were at preschool, we buckled our babies into strollers and walked off our pregnancy weight together, often stopping along the way to sit down in the grass and nurse a screeching baby or to change a diaper blow-out. On these longs walks, we commiserated over our postpartum bodies, sleep deprivation, teething, the witching hour, and whatever issues we were grappling with on any given day. It’s really starting to hit me how much I’m going to miss this kind of support when our new baby comes. 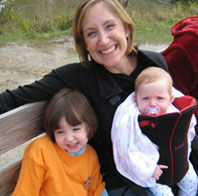 As an experienced mom with three kids of her own, Katie has been a source of advice and inspiration for me. She’s the kind of friend who I could talk to about things like baby blues or birth control. She’s the kind of friend who I could swap babysitting with in a heartbeat. The kind of friend who sends over bags of hand-me-down raincoats and Halloween costumes and baby gear; who shows up the morning of your daughter’s birthday party in a total downpour to save the day with a giant-sized tent; the kind of friend you could joke with about wanting to stick a straw in a bottle of wine after a long, hard day when you’ve finally gotten your melting-down kids to bed. Friends like this are hard to come by. More than ever, I’m realizing how important my “mom friends” are in my life. When Julia was born, I joined a new mother’s group at the hospital, and it saved me during those newborn months. Just getting out of the house to talk to other moms who were going through the same things I was going through—hormonal changes, fatigue, breastfeeding issues—taught me the importance of having a community of moms around me. Several of the women from our hospital group have remained friends through the years, and it’s been so fun to see our kids grow up together. We’ve since gone through second—and third—pregnancies and births together, and their support and friendship has been invaluable along the way. My friend Elizabeth, who has three kids, just left me a voicemail about her day, which included such tidbits as her 2-year-old biting her 4-year-old. My sister called to vent about her middle daughter dumping an entire bottle of baby powder all over her little sister. My friend Nicole e-mailed to say that she changed five poopy diapers in the middle of the night. My friend Beth left a message saying that she’s just plain tired. I’m so thankful to have these ladies in my life—each and every one of them—to share the little things, the big things, the bad days, and the good days. I know that in the coming months, whether they’re near or far, on the East coast, the West coast, or anywhere in between, I’m going to need them in my life more than ever.